Sirotechnics Produce Stunning Indoor Pyro Presentations too! Stage Pyro, Indoor Pyro, Pyrotechnics, these are all types of essentially what are types of firework indoors. The difference? Well they are normally of a smaller nature and made in a different way to make them suitable for indoor use at close proximity. Many of the effects can be used at only 3 metres away from people and props, if not closer. 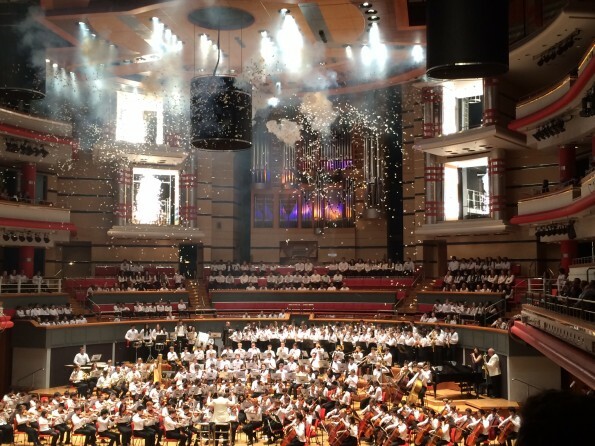 We were asked to close the proceedings for the joint KES and KEHS school summer concert, using a variety of noise and flash effects for the 1812 overture. Simulation of the bangs were required. Here is a smart photo of the finale where jets, confetti and airbursts were used, all manufactured in the UK by the top producer Wells Fireworks. Sirotechnics are able to fire Pyro to live bands and orchestras using a state of the art wireless firing system. It means we are in complete control of the timings and work with a score reader to ensure we hit the exact notes you require. It is basically manual fire of a pyromusical in many ways! We can position the indoor pyro in many places that are often hard to reach using wired systems. In-fact we were told by the back stage crew it was the best they had ever seen at this particular venue. Pyrotechnics can be used much closer than in traditional firework displays. This means we can use them on the catwalk, dance-floor, stage, stadium, or anywhere we can access! Make your event stand out with Pyrotechnics from Sirotechnics! If you are looking for indoor pyro or indoor pyrotechnics, why not get in touch to see how we can help you. We are always happy to give you a quote.